Olivia is a licensed cosmetologist & graduated from Paul Mitchell the School in Fort Myers, FL. 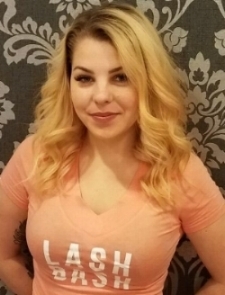 She received additional training for eyelash extensions while in school and has an advanced certification in Lash Artistry and Russian Volume Lashes from Borboleta. She is passionate about veganism, rescue animals, the beauty industry and volume lashes! Inna is a licensed esthetician and graduate of Jean Madeline Aveda Institute in West Philadelphia. Originally from Ukraine Inna has been doing lashes and providing esthetician services for over 7 years. She has a passion for lashes, Philly and her adorable dog! Chandara attended esthetics school at Queen Beauty Academy in Philadelphia. While completing her certification for lash extensions she quickly learned she had a natural ability for lashing. She is a true crafter at heart and makes her own soaps and beauty products in her spare time! Cheyney is a licensed esthetician in Pennsylvania and graduated from Rizzieri Aveda School’s skincare program in New Jersey. When she was in school she became a certified lash tech through Lash Bash and quickly found a love for lashing, waxing and the beauty industry! Erin is a lifestyle expert who has merged her background in luxury hospitality with her passion for makeup into a successful lash & beauty brand (Lash Bash). She's the owner of Lash Bash Philly and has a passion for lashes, beauty and the latest trends. Lash Bash opened its first location in Philadelphia's Rittenhouse Square in 2015. Erin graduated from the University of Pennsylvania in 2006 with a B.A. in Communications and also holds a Post-Graduate diploma in Hotel & Restaurant Management from École hôtelière de Lausanne. She's certified in both Classic and Russian Volume lash extensions. Erin is a licensed esthetician and a graduate of the Esthiology Program at the Jean Madeline Institute (Philadelphia). Interested in joining our team? Please send a resume, cover letter and recent pictures of your work to info@lashbashphilly.com.